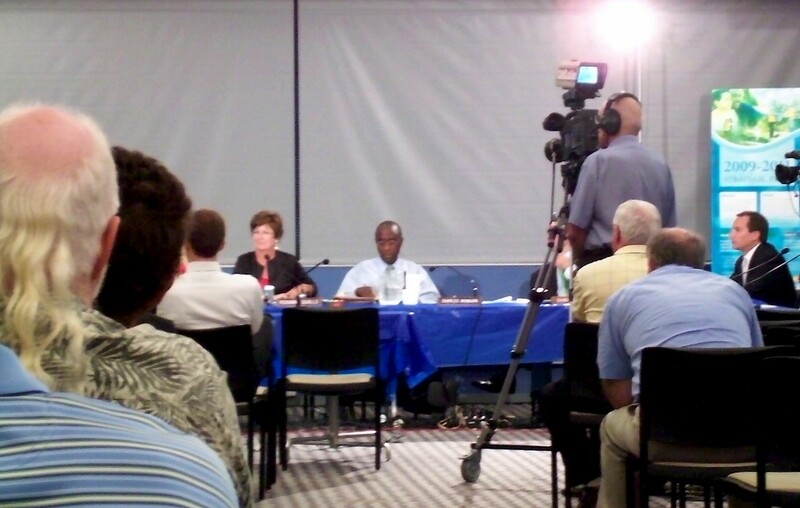 Cincinnati City Council members met for a public hearing of the Budget and Finance Committee in Lower Price Hill Wednesday night to discuss several council members’ counter-proposal to City Manager Milton Dohoney’s 2011 Mid-Year Reduction Plan. The proposed motion, signed by council members Chris Bortz, Leslie Ghiz, Wayne Lippert, Amy Murray, and Charlie Winburn, would pass budget cuts—which largely include expected savings from job position vacancies, department reorganization, and service funding reduction—totaling savings of $5.1 million for 2011 and $8.5 million for 2012. The most notable exception in the motion would be retaining the 44 police officers that Dohoney proposed letting go (memo with complete list of numbers). Wednesday night’s meeting was scheduled to obtain feedback from the public, as well as to vote on the 5 council members’ proposal. City Council image by Zachary Schunn for UrbanCincy. Others spoke passionately about health services, from the Cincinnati Health Department, which was scheduled for cuts, to the city’s dental access program, to health clinics. One nurse noted that the Health Department would be self-sustaining due to federal revenue by 2014, and that cutting funding would be a short-sighted move that would not only hurt citizens, but would make it difficult to build-up the department when new funding arrived. A few others spoke for the homeless or in support of Cincinnati’s recreation centers and pools. Several spoke in favor of the Office of Environmental Quality, which was slated to be closed, with its services shifting to other departments. Said one citizen, “Shutting OEQ is like killing a goose that lays golden eggs.” Another pointed out the revenue that the OEQ has brought in from reduced landfill costs and federal grant money, and argued that the office’s success should lead to its expansion, not its elimination. Notably, only one person spoke against police layoffs (which were not part of the proposed motion). No one spoke of the burdens of high tax rates, with several speaking in favor of higher fees (such as trash collection fees) and increased property and income taxes. One neighborhood representative suggested the income tax rate should be raised from 2.1% to 3.1% to help close the deficit, and another noted that the rich needed to give back to the city. A few commended the council’s hard work in performing a “difficult task,” and others asked that they ignore their differences and work together. One citizen brought the book, “The Three Little Pigs,” and recounted its lesson of cooperation to the Council. With Ghiz and Murray absent, the motion failed with three supporting and four against. The meeting ended with bickering over “politics,” with Councilmen Thomas and Bortz arguing over which side was “gaming” the other. Frustrated, Vice Mayor Roxanne Qualls abruptly ended the meeting. Citizens, obviously frustrated by the length of the nearly three-hour-long meeting, left the building largely rejoicing that the cuts to social services had failed, but knowing that a similar motion may be re-filed and that they would have to return—again—to argue against the cuts.